Coming soon. 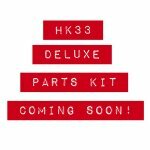 Deluxe HK33 parts kit complete with receiver flat and RCM cold hammer forged barrel. Once available we will upload images and a detailed spec sheet. This will be the absolute nicest quality, and nicest condition parts that cane be found for the HK33.